With the production on CAVE coming to an end, I have gone back to working on keyframe animation. It’s something I think that has the potential to look better than mocap, if done correctly, but we couldn’t use it for CAVE due to the amount of time it takes to do it. I started to do the keyframe animation for myself in order to improve my skills as an animator. 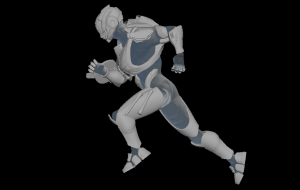 As I began to spend multiple hours on a single animation, I began to wonder whether or not keyframe animation could ever achieve the fidelity and speed of a mocap performance. 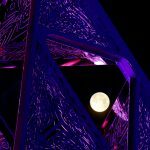 Is mocap going to render keyframe animation – oh humanoid characters at least – obsolete? I’ll pose this question today but discuss it more next time after I have had time to gather more examples of motion capture. For now, I will give a quick and dirty tutorial on the basics of keyframe animation using a run cycle as an example. Animators usually have their own unique methods when it comes to animating but most are a derivation of 2 techniques: pose-to-pose and straight ahead. Pose to pose animation is pretty much what it sounds like. The animator plans out the different poses a character is going to make over the course of a scene then fills in the frames between those poses. This technique is the most commonly used and allows an animator to carefully plan out a scene and its timing. Straight ahead animation is a more advanced technique where the animator creates the poses and in-betweens as they animate a character in a scene. The results of this method can be unpredictable but can produce a more creative and spontaneous animation. A simple animation like a run cycle generally uses pose-to-pose animation. So the first step in creating a run cycle is finding the right poses. It’s good to start with extremes then work your way down. 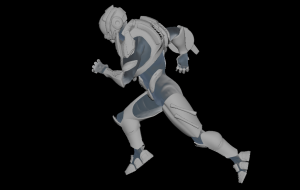 For a run cycle, an extreme is when one of the knees has been brought up as far as the character will take it and the other leg is extended behind the character; the same goes for the arm. The chest and the pelvis will be rotated in opposite directions with the chest turned towards the leg which is raised. There will be 2 different extremes. One is used as the first and last frame of the cycle and the second will be the middle frame. At this point, you need to decide on the length of the animation. For a run cycle, I generally use 2/3 of one second of the animation. So if you’re animating at 30 FPS, your cycle would be 20 frames long. Once the extreme poses have been locked in, you can begin making in between poses. Find the frames exactly in between the extremes – in my case they are 6 and 16 – and create a pose showing one foot firmly planted on the ground and the other passing by that foot. The arm on the opposite side of the leg that is on the ground will be moving backward. This arm will be at the lowest point in its arc at this pose. The other arm will be moving forward so it will be slightly ahead of the body and bent at the elbow. The chest and pelvis should have almost zero rotation at this point. 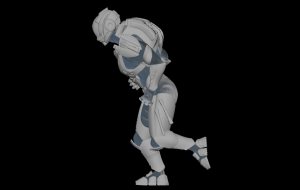 With this, you should have an animation with a total of 5 keyframed poses. From this point on, you will not be creating keys for the entire character. Observe the movement of each limb individually and ensure that they have arced movements like pendulums by adding keys and poses where needed. They should spend more time closer to their extremes and less time moving between them. Be sure to check the animation curves as well and adjust them to get the pendulum-like movement. 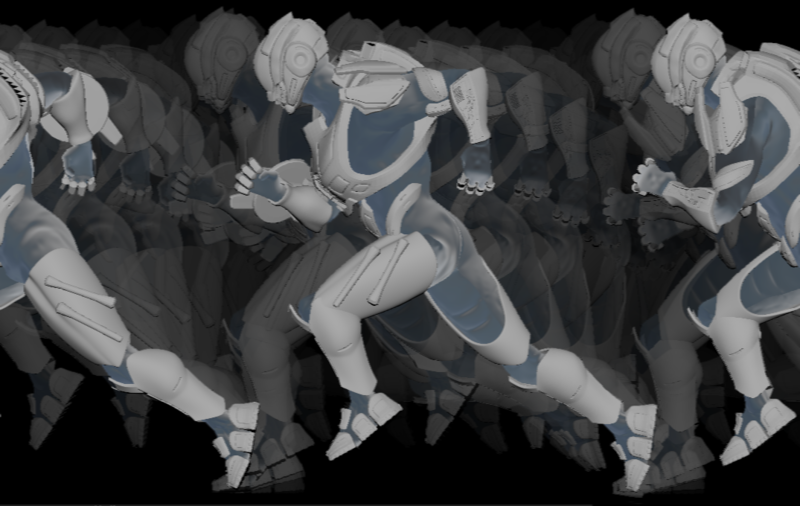 The last step is to offset the keyframes for the arms and legs. Simply move all the keys for the arms a few frames ahead of the legs – around 3 frames should be fine. Offset the chest from the pelvis by moving the chest forward as well but not quite as far as the arms. This gives the character more life as it feels like the movement of one part of the body is affecting another part of the body. 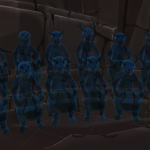 It’s a subtle change but it makes the animation better or at least helps the movement seem more natural. There’s a lot more to learn when it comes to animation such as the depiction of weight, creating balance, secondary motion, and follow through but this isn’t the place to go over all of that. The most important thing to keep in mind making sure that no part of the character is ever completely still as that completely breaks the illusion of the character as a living thing. Seeing all the work that goes into creating even a simple animation such as this adds credence to the idea that motion capture is better than keyframe animation due to the speed with which it can create animations. But I think there are still many concessions that have to be made while using motion capture and they will hopefully become apparent in my next post when I am able to compare a keyframed animation to a motion-captured version of it.